Hell is a place of torment, ordained by God for Devils and reprobate sinners, wherein by His justice He confines them to everlasting punishment; tormenting them both in Body and Soul, being deprived of God’s favor, objects of His wrath, under which they must lie to all eternity. 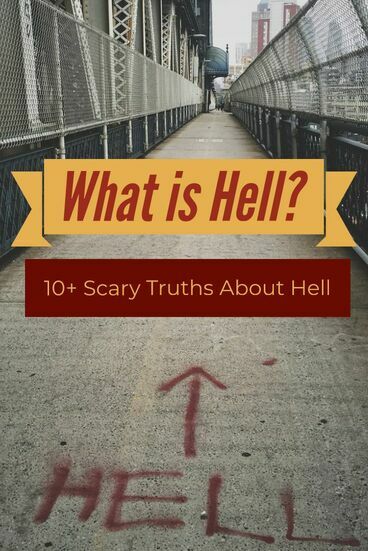 In the Old Testament “hell” is not specifically mentioned in name, but the word used in reference to the after life is “Sheol,” which is used to refer to the dwelling place of people after death. In the Old Testament, “Sheol” is not just for the wicked, but it is also for those who lived righteously. 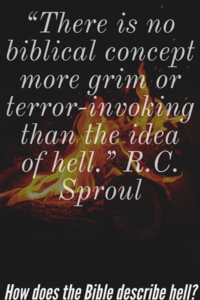 Post-canonical Jewish writings, penned between the close of the Old Testament and the beginning of the New Testament, did make distinctions in “Sheol” for the wicked and the righteous. The account of the rich man and Lazarus in Luke 16:19-31 supports this view. Psalm 9:17 states that, “The wicked shall return to Sheol, all the nations that forget God.” Psalms 55:15b states, “ 15b…let them go down to Sheol alive; for evil is in their dwelling place and in their heart.” In both of these passages it is a place for the wicked, the ones in whom evil dwells in their hearts.. So in light of this, what is an accurate description of “Sheol” for the wicked? Job 10:21b-22 states that it is “21b…the land of darkness and deep shadow 22the land of gloom like thick darkness, like deep shadow without any order, where light is as thick darkness.” Job 17:6b states that it has bars. Psalms 88:6b-7 states that it is“6b…in the regions dark and deep, 7 Your wrath lies heavy upon me, and you overwhelm me with all your waves. Selah.” So based on these passages in Job and Psalms the description of “Sheol” is that it is a place that is deep, covered in darkness, chaos, a prison, and where God’s wrath is experienced. In the New Testament, “Sheol” is mentioned in Luke 16:19-31. The description in this passage is that it is a place of torment (16:23a & 16:28b) anguish (16:24b & 16:25b) and flame (16:23b). After an examination of the Old Testament, one can see that Sheol was a place of suffering for the wicked. It is a noun derived from the Hebrew phrase gy’ hnwm, which means “Valley of Hinnom.” The Valley of Hinnom was a ravine along the southern slope of Jerusalem. In Old Testament times, it was a place used for offering sacrifices to foreign gods. Eventually, the site was used to burn refuse. When the Jews discussed punishment in the afterlife, they employed the image of this smoldering waste dump. The “fire” into which the unfruitful trees are cast is evidently a symbol of the final outpouring of God’s wrath upon the wicked…The fire is unquenchable. The point is not merely that there is always a fire burning in Gehenna but that God burns the wicked with unquenchable fire, the fire that has been prepared for them as well as for the devil and his angels. So the wicked, having been separated from the good, will be cast into hell, the place of unquenchable fire. Their punishment is unending. The point is not merely that there is always a fire burning in Gehenna but that the wicked are burned with unquenchable fire, the fire that has been prepared for them as well as for the devil and his angels. Their worm never dies. Their shame is everlasting. So are their bonds. They will be tormented with fire and brimstone…and the smoke of their torment ascend forever and ever, so that they have no rest day or night. Fire causes the greatest pain known to man, and the furnace of fire into which the sinners are cast represents the excruciating torment of hell, which is the destiny of every unbeliever. This fire of hell is unquenchable, eternal and is pictured as a great “lake of fire which burns with brimstone.” The punishment is so fearsome that in that place there shall be weeping and gnashing of teeth. As to weeping…The tears which Jesus speaks here in Matt. 8:12 are those of inconsolable, never-ending wretchedness, and utter, everlasting hopelessness. The accompanying grinding or gnashing of teeth denotes excruciating pain and frenzied anger. This grinding of teeth, too, will never come to an end or cease. In Matthew 18:8-9 Jesus teaches on temptations to sin and that it better for a person to go without the limbs that allow them to give into sin, then for their whole body to be cast into hell. And in Matthew 25:41-46 the unrighteous will depart from God into eternal fire prepared for the Devil and his angels for eternal punishment. In conclusion, in The Gospel of Matthew, hell is described as the place of fire, which is unquenchable, containing suffering, weeping and gnashing of teeth. Those who will inhabit hell are the devil and his angels. Also, all those who do not bear fruit because of their unbelief, those guilty of murder and lust in their hearts and those who do not believe and trust in the Lord Jesus Christ. They are the ones guilty of the sins of omission and commission. New Testament Scholar James A. Brooks explains that the “worms” and “fire “are symbolic of destruction. Therefore, in the Gospel of Mark, hell is also described as the place where those who do not repent of sin are cast into its unquenchable flames, where their destruction is for all of eternity. The Gospel of Luke mentions hell in Luke 3:9, 3:17, 10:15 and 16:23. Luke 3:9 and 3:17 are the same account found in Matthew 3:10 and 3:12. Luke 10:15 is the same as Matthew 11:23. But Luke 16:23 is part of the passage on the rich man and Lazarus, Luke 16:19-31, which was mentioned in the explanation of “Sheol.” We must remember that the description in this passage is that it is a place of torment (16:23a & 16:28b) anguish (16:24b & 16:25b) and flame (16:23b). Scholar Robert H. Stein explains that the reference of the rich man’s torment shows that those who dwell there are “…continuing in a terrible conscious and irreversible condition after death.” He explains that fire is “…frequently associated with the final destiny of the unrighteous” So, the Gospel of Luke describes hell as a place fire, that is unquenchable, torment and agony. Those who will dwell there are those who do not bear fruit and are guilty of unbelief. The Gospel of John has only one reference to hell. In John 15:6 Jesus explains that those who do not abide in Jesus Christ are thrown away like a dead branch and will wither. Those branches are gathered and thrown in the fire where they burn. Hendriksen explains that those who do not abide have rejected the Light, the Lord Jesus Christ. New Testament Scholar D.A. Carson explains that the fire symbolizes judgment. So in the Gospel of John, hell is described as the place where those who reject Christ are thrown in the fire to be burned. The emphasis falls on the adjective fearful. The word occurs three times in the New Testament, all in this epistle. This adjective is translated “fearful,” “dreadful,” and “terrifying.” In all three instances its use pertains to meeting God. The sinner cannot escape God’s judgment and, unless he has been forgiven in Christ, faces an angry God on that dreadful day. The letter of Hebrews tells us that hell is described as the place where those who reject Jesus Christ by not choosing him as their sacrifice, will experience a terrifying judgment from God and they will be consumed by fire. In the second letter of Peter, Peter writes concerning false prophets and false teachers. In second Peter 2:4 he explains how God punished fallen angels. He cast the fallen angels into hell when they sinned, and he committed them to chains of gloomy darkness until the judgment. The interesting thing about this passage is that the word used for “Hell” in the original Greek is “Tartaros,” and this is the only time this word is used in the New Testament. This term is a Greek term that Peter was using in order for his Gentile readers to understand hell. So in the second letter of Peter, hell is described as the place where the fallen angels are cast into for their sin and where chains of gloomy darkness hold them until judgment. Jude characterized the punishment endured as eternal fire. This fire functions as an example because it is a type or anticipation of what is to come for all those who reject God. The destruction of Sodom and Gomorrah is not merely a historical curiosity; it functions typology as a prophecy of what is in store for the rebellious. The narrative stresses the devastation of the Lord raining fire and brimstone upon the cities. The brimstone, salt and wasted nature of the land function as a warning for Israel and the church elsewhere in the Scriptures. So, in the book of Jude, hell is described as the place where unbelievers and rebellious angels will experience a more extreme fire, and devastation, than Sodom and Gomorrah experienced. In our passage the fiery lake is said to burn with sulfur, a yellow substances that burns readily in air. It is found in a natural state in volcanic areas such as the valley of the Dead Sea. A like of burning sulfur would not only be intensely hot, but malodorous and fetid as well. It is an appropriate place for all that is sinful and wicked in the world. The Antichrist and the false prophet are its first inhabitants. In Revelation 20:10, the devil is also thrown in the same lake of fire as the beast and the false prophet, where they are tormented day and night, forever. In Revelation 20:13-14 Death, Hades and those whose name are not written in the book of life are thrown into the lake of fire, which is the second death. And in Revelation 21:8 the cowardly, the faithless, the detestable, murderers, the sexual immoral, sorcerers, idolaters and all liars their portion will be in the lake of fire that burns with sulfur, which is the second death. So, in the Book of Revelation, hell is described as a place where those who are the enemies of God will experience the full wrath of God in the lake of fire, for all of eternity. If we believe the Word of God to indeed be inerrant, we must consider the warning and danger of hell. It is a harsh reality echoed throughout the pages of Scripture and only reserved for the devil, his servants and for those who reject the authority of Christ. As believers, we must do everything in our power to reach the world around with us the Gospel and save others from experiencing the fiery, righteous judgment of God without Christ. Mounce, William D., Smith, Matthew D., Van Pelt, Miles V. 2006. Mounce’s Complete Expository Dictionary of Old & New Testament Words. Grand Rapids, Michigan: Zondervan. MacArthur, John F. 1987. The MacArthur New Testament Commentary: Matthew 8-15. Chicago: The Moody Bible Institute. Hendriksen, William. 1973. New Testament Commentary: Exposition of the Gospel According to Matthew. Michigan: Baker Book House. Blomberg, Craig L. 1992. The New American Commentary, An Exegetical and Theological Exposition of the Holy Scripture: Volume 22, Matthew. Nashville: B & H Publishing Group. Chamblin, J. Knox. 2010. Matthew, A Mentor Commentary Volume 1: Chapters 1 – 13. Great Britain: Christian Focus Publications. Hendriksen, William. 1975. New Testament Commentary: Exposition of the Gospel According to Mark. Michigan: Baker Book House. Brooks, James A. 1991. The New American Commentary, An Exegetical and Theological Exposition of the Holy Scripture: Volume 23, Mark. Nashville: B & H Publishing Group. Hendriksen, William. 1953. New Testament Commentary: Exposition of the Gospel According to John. Michigan: Baker Book House. Carson, D. A. 1991. The Gospel According to John. U.K.: APPOLOS. Schreiner, Thomas R. 2003. The New American Commentary, An Exegetical and Theological Exposition of the Holy Scripture: Volume 37, 1, 2 Peter, Jude. Nashville: B & H Publishing Group. Mounce, Robert H. 1997. The Book of Revelation, Revised. Michigan: Wm. B. Eerdmans Publishing Co.
Packer, J. I. 1993. Concise Theology: A Guide to Historic Christian Beliefs. Illinois: Tyndale House Publishers, Inc.
Sproul, R. C. 1992. Essential Truths of the Christian Faith. Illinois: Tyndale House Publishers, Inc.
Beeke, Joel R., Jones, Mark. 2012. A Puritan Theology. Michigan: Reformation Heritage Books. Grudem, Wayne. 1994. Systematic Theology: An Introduction to Biblical Doctrine. Michigan: Zondervan. Joel R. Beeke and Mark Jones A Puritan Theology page 833. Seal, D. (2016). Hell. In J. D. Barry, D. Bomar, D. R. Brown, R. Klippenstein, D. Mangum, C. Sinclair Wolcott, … W. Widder (Eds. ), The Lexham Bible Dictionary. Bellingham, WA: Lexham Press. Powell, R. E. (1988). Hell. In Baker encyclopedia of the Bible (Vol. 1, p. 953). Grand Rapids, MI: Baker Book House. Austin, B. M. (2014). Afterlife. D. Mangum, D. R. Brown, R. Klippenstein, & R. Hurst (Eds. ), Lexham Theological Wordbook. Bellingham, WA: Lexham Press. Geisler, N. L. (1999). Hell. In Baker encyclopedia of Christian apologetics (p. 310). Grand Rapids, MI: Baker Books. Craig Blomberg, New American Commentary, Matthew page 178. Knox Chamblin, Matthew, A Mentor Commentary Vol. 1 Chapters 1-13, pages 623. John MacArthur The MacArthur New Testament Commentary, Matthew 8-15 page 379. Stein, R. H. (1992). Luke (Vol. 24, p. 424). Nashville: Broadman & Holman Publishers. Stein, R. H. (1992). Luke (Vol. 24, p. 425). Nashville: Broadman & Holman Publishers. One must be carful when examining this passage because there is a danger in believing that one can loose their salvation, which is not inline with the overall teaching of scripture. Lenski, R. C. H. (1966). The interpretation of the epistles of St. Peter, St. John and St. Jude (p. 310). Minneapolis, MN: Augsburg Publishing House. Next: Does God Change His Mind In The Bible?